After the struggle against the demon Noi Tai Dar, our heroes seek activities to soothe their souls. Leonardo and Master Splinter train on a hillside. The Sensei explains to Leonardo that a true swordsman must empty his mind of all thought when doing battle – there must only be flow, the swordsman must become one with his blade. Splinter has little trouble disarming and defeating his student, and Leonardo tries to take in the lesson before the two break for lunch. Leo notes that Japan is where all of their lives began – it is the home of Master Splinter as well as the Foot Clan. The Sensei agrees, and asks his students to explore their homeland, so that they can better understand their teachings and origins. 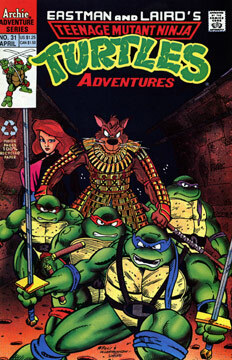 The Turtles eagerly agree and ask where to begin, and Splinter tells them to first separate from one another. Mike joins the girl and the two head off to fly a kite. Ninjara takes Raphael to visit some stone monuments. Donatello decides to check on how the containment process is going at the nuclear power plant – but he chooses to go alone. Splinter asks Leo to continue his lessons. Fu Sheng is left alone, as April and Chu are wrapped in conversation. Ninjara and Raphael arrive at the shrine. The Turtle wonders why there are so many crows around, and the fox explains that they are probably drawn to the dark power contained in the Torii. Raph asks if these monuments are really a gateway to a dimension filled with demons, and Ninjara assures him that it is true – the Torii are a gateway to the Yomi, or Underworld or “Land of Gloom.” Raph feels compelled by the Torii and Ninjara warns him to be careful, as they contain mesmerizing power over those who are open to it. The Turtle begins to stutter and Ninjara orders him to “Let it go!” in the nick of time. Shaken, Raph leans on the fox for support and thanks her for her help. Ninjara notes that Raph has an affinity to the Torii, and she tells him that she likes that. Suddenly, the foxy ninja smells something on the wind… cologne? We see four human figures hidden in shadows, spying on the mutants. Donatello is watching helicopters pouring cement on the nuclear power plant. The men are burying the radioactive plant in concrete, the same way that Chernobyl was sealed. Don finds the solution somewhat pedestrian, but is impressed by the engineering involved. His thoughts are interrupted as two crows fly by – and then a strange white energy ball forms in front of the mutant. Donatello wonders if it’s an after effect of the demon’s sorcery, or of the radiation. Leo and Splinter continue to train, but once again Leonardo is unarmed. Splinter reminds him, “Be one with your sword, Leonardo.” The Turtle thanks his mentor and the teacher thanks his student as the sun begins to set. Mikey and his friend exchange haikus as they fly a large kite decorated with a yellow dragon. Feng Shu trains Chu Hsi to control the spirit of the Warrior Dragon while April practices with her katana. After a time, Chu manages to shrink the gigantic form of the Warrior Dragon down to his normal height. April is impressed. “I’m honored.” replies the ninja turtle, as the two battle the young men. Donatello watches the energy ball as it transforms into the Yin Yang symbol and speaks to him, explaining that it is all things feminine as well as all things masculine – for it is the Tao. Don is bewildered at first, but then smiles and introduces himself. The Yin Yang asks Donatello to follow it, and it leads him up a mountain. Once he reaches the top, Donatello can see that the men have finished filling in the damaged nuclear power plant, and the concrete forms the Yin Yang symbol. “I still don’t get it…” Don states. “There is ebb, there is flow,” the symbol explains, “There is give, there is take. Every saving has its cost. Tao is all.” And with that, the Yin Yang symbol disappears. “Too weird.” notes the Turtle as he looks on in awe. April and Chu share a kiss by the moonlight. April breaks away and says that they need to slow down, and Chu agrees. He takes O’Neil by the hand and the pair head off to join Fu Sheng for dinner. Leonardo and Master Splinter continue their training. The pair lunge at one another, and both their blades shatter upon impact. “Thank you, Master.” Leo replies, as the two bow to one another. Far above the Japanese islands, the Yin Yang symbol joins Izanagi and Izanami.